The Sauce is one of four bands appearing at the inaugural Band+Aid event. Four bands will compete against each other for prizes and bragging rights at the inaugural Band+Aid event in support of pediatric healthcare at Shaare Zedek’s Wilf Children’s Hospital in Jerusalem. Band+Aid, presented by the Young Hearts Divison of the Canadian Shaare Zedek Hospital Foundation, kicks off the Throwback to Your Youth Campaign, on Aug. 22 at Toronto’s Hard Rock Café. The four bands are The Garden, Black Mink, The Sauce and Hot Mess. The members of The Garden pride themselves on covering 60 years’ worth of classic rock. The band features Mark Wexler, vocals; Phil Aube, guitar; Anthony Regan, guitar/keys; Jon Kazdan, bass; Joe Franze, drums; and Sam Merkur, vocals. Black Mink combines a unique pairing of soulful vocals and guitar-driven hooks. They play music from rock to soul, motown to reggae. Band members are Franklin King, vocals; Randy Starr, guitar/vocals; Gerald Ramal, bass; Nick Van Loon, drums; and Ryan Szainwald, keyboards. The Sauce covers the best of ’80s and ’90s music. Band members include Rob Wexler, vocals/guitar; Jon Abrams, bass guitar; Corby Fine, drums; and James Leone, lead guitar. Hot Mess performs original songs rooted in rock and funk. Band members are Aaron Diamond, drums; Josh Mandel, guitar; Alex Eisenberg, bass; and Jen Berk, vocals. Jamie Gutfreund from CP24 will host the event. For more than 110 years, Shaare Zedek Medical Center has responded to the needs of the people of Jerusalem by providing world-class health care for 500,000 patients annually. Once a 20-bed hospital on Jaffa Road back in 1902, Shaare Zedek has since transformed into a 700-bed facility with centers of excellence that treat patients of every race, religion and nationality. Known as the Hospital with a Heart, Shaare Zedek Medical Centre relies on donors around the world, as it does not receive government support for education, equipment or research. For more information and to purchase tickets go to http://www.bandaidforacause.com/. In a reversal of current medical thinking, a new Israeli study says that all Jewish Ashkenazi women over 30 should be tested for the BRAC1 and BRAC2 mutations, even if they don’t have a family history of breast or ovarian cancer. “We should be testing women who are still healthy at a stage when we can prevent the disease,” Dr. Ephrat Levy-Lahad, director of the Fuld Family Department of Genetics at Shaare Zedek Medical Center, said of her findings, which will be published in the Journal Proceedings of the National Academy of Sciences. Levy-Lahad presented the research at the hospital’s second annual breast cancer symposium, held Sept. 10 at Shaare Zedek in Jerusalem. The study found that Ashkenazi women who tested positive for the genetic mutations during random screenings had high rates of breast and ovarian cancer, even when they had no family history of the disease. Many of the women identified by the researchers would never have known they were carrying the mutation if not for the screening offered by the study. The two most common breast cancer genes are BRCA1 and BRCA2. Everyone is born with them, and normally they help protect cells from cancerous changes. It’s estimated that one in 40 Ashkenazi Jewish women – about 2.3 per cent – carry a BRCA1 or BRCA2 gene mutation, compared to one of every 800 members of the general population, according to the U.S. Centres for Disease Control. Women carrying a BRCA1 or BRCA2 gene mutation also have a higher than usual risk of developing ovarian cancer. In 1997, researchers at Shaare Zedek, under the guidance of Levy-Lahad, discovered that one-third of the cases of ovarian cancer in Ashkenazi women are due to inherited mutations in the BRCA1 and BRCA2 genes. Since that time, these genes have also been linked to the occurrence of breast cancer. The new study was done on women of Ashkenazi origin, because in the Ashkenazi population, there are three common mutations that are easy to check at low cost. To reach random women, 8,000 healthy Ashkenazi men were tested. Of that number, 175 were found to carry the mutation (the gene exists in men but affects almost exclusively women). The women in the families of the carrier men were tested and their family histories were documented. Half of the female carriers had no family history of breast or ovarian cancer. According to criteria in use today, these women would not have been tested at all, and the gene would have been discovered only after the onset of cancer symptoms. This means that one in every 100 women – one per cent of the population – is not aware she’s a carrier and, therefore, is at risk for breast and ovarian cancer without the ability to take preventive measures. This significant finding led the researchers to the conclusion that each woman of this group needs to be genetically screened for mutations in the BRCA1 and BRCA2 genes. Dr. Steven Narod, a world leader in the field of breast and ovarian cancer genetics at the University of Toronto’s affiliated Women’s College Research Institute, has been conducting ongoing testing for BRCA1 and BRCA2. “We agree with the position that all Ashkenazi Jewish women be tested. It is better to prevent the cancer than treat it,” he said. He said he hopes the Israeli study will encourage more research on BRCA gene mutations in the Ashkenazi population. A couple of weeks ago, as organizers from the Canadian Shaare Zedek Hospital Foundation prepped for their Toronto fundraiser, two Israelis were attacked by four Palestinians in Jerusalem’s Old City. 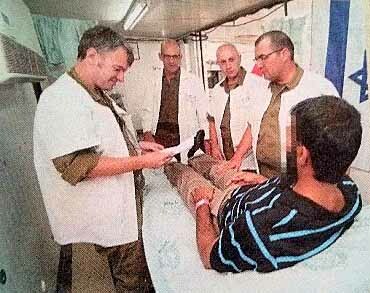 They were rushed to Shaare Zedek Medical Centre. The city’s fastest-growing hospital has garnered its share of media attention recently. It has treated many terror victims – and some of the attackers, too – during the recent surge in violence. But the high-profile patients form just a small part of its care. The recent Toronto event supported the Wilf Children’s Hospital. Called ‘From the Heart,’ the Canadian group’s signature event drew a crowd of 400 to Toronto’s Beth Torah Congregation. When the Wilf Children’s Hospital moves to Shaare Zedek’s new next generation building early next year, it will occupy the sixth and seventh floors alongside distinguished tenants. On the ninth floor sits the largest and most advanced neonatal intensive care unit in Israel, and the fifth floor houses its new IVF clinic. The building, which opened early this year, cost about 130 million NIS. The evening also featured an address by Jeb Bush, whose latent presidential campaign continues to gather steam, and a presentation of the Kurt and Edith Rothschild Humanitarian Award to Senator Linda Frum. A year ago, Frum presented the inaugural award to MP Irwin Cotler. The Montreal native returned the compliment this time around. Appointed to the Senate in 2009 by Prime Minister Stephen Harper, Frum has worked on a variety of projects. In 2012, she became co-chair of the Advisory Council for the 2013 Task Force for International Cooperation on Holocaust Education, Remembrance and Research. In 2013, Frum was appointed as a member of an advisory council of industry leaders to promote the participation of women on corporate boards in Canada. She has also advocated for Israel and she praised Shaare Zedek’s ability to leave politics at the hospital’s doorstep. A journalist before leaving to represent Ontario, Frum has written two bestselling books. One – Barbara Frum: A Daughter’s Memoir – told of her CBC-icon mother. Her tenure in the Senate has been made easier by the Conservative government’s Middle East stance. And she singled out Harper for his willingness to champion a foreign policy that is at times out of step with other world leaders’ visions. Life imitated art at the Canadian Shaare Zedek Hospital Foundation ‘friendraiser’ featuring a guided tour of Torys LLP’s private art collection. Seen here is Marni Wolfe, the event’s organizer, with Pascal Grandmaison’s Waiting. 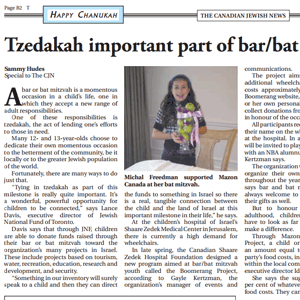 Fundraisers at the Canadian Shaare Zedek Hospital Foundation are looking ahead to address an age-old non-profit puzzle: engaging the donors of the next generation. 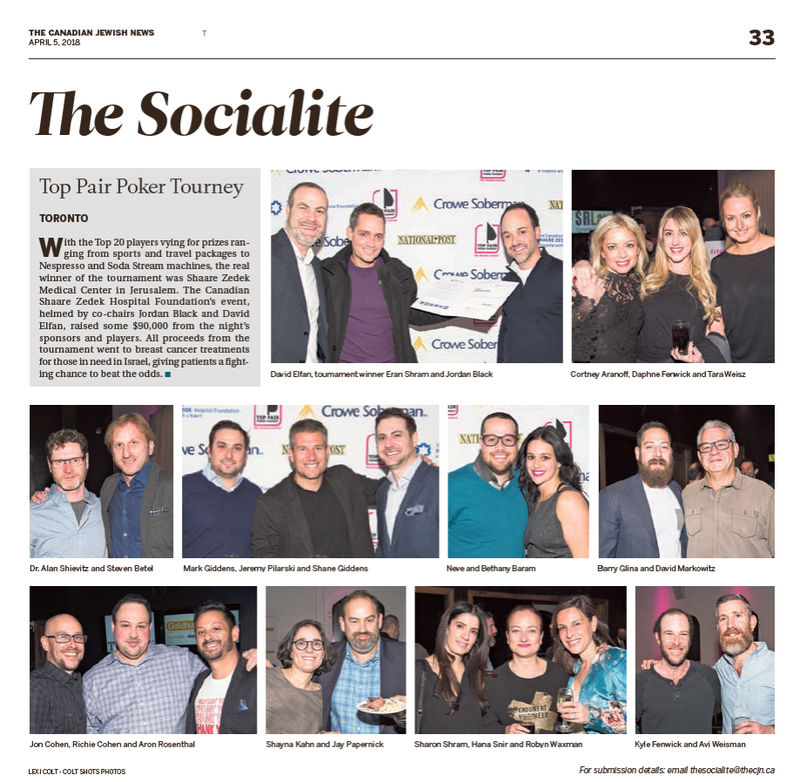 Many from that target age group – 22 to 38 – didn’t attend the group’s November gala; or the February event at Maple Leaf Gardens, featuring former Toronto Maple Leaf Darcy Tucker; or the other February event, a ski-and-snowboard day. But about 25 of them were on hand last week, sampling art, wine and cheese, and – organizers hope – generating momentum. “It’s more a ‘friendraiser’ event, rather than a fundraiser event,” said Marni Wolfe, one of the four chairs of the foundation’s Young Hearts cabinet, of the $18-per-head evening. The second of the four-evening series, State of the Art, which introduces attendees to private art collections in Toronto was held recently at Torys LLP. The next installment, at a private Yorkville residence with capacity for 15 people, is sold out, but tickets are still available for a June 25 visit to the Kosoy + Bouchard studio. All proceeds will go to the Wilf Children’s Hospital at Shaare Zedek Medical Centre, Jerusalem’s fastest-growing hospital. Just two months ago, the city approved an expansion that will double its real estate. All this at a time when the city’s Hadassah Medical Centre weathers financial woes. “For a lot of people art is a really intimidating thing,” said Wolfe, whose passion for the arts led her to organize the series. While Young Hearts launched about two-and-a-half years ago, management devoted 2012 to planning and 2013 featured one event. This year three events, including State of the Art, are in the offing. Organizers hope to raise $30,000 – about $2,000 from the art series. Friendraising the next generation might seem like a long game, but non-profits have no choice but to patiently match bash to benefactor. Of course, instant validation from the next generation’s potential heavy hitters never hurts, either. Former Toronto Maple Leaf Darcy Tucker (third from left, bottom row) helped a worthy cause recently at Maple Leaf Gardens helping hockey lovers raise money for the new Neonatal Intensive Care Unit at the Shaare Zedek Medical Centre in Jerusalem. Hockey lovers who raised about $100,000 for an Israeli hospital donned their skates recently to participate in a game at Maple Leaf Gardens featuring National Hockey League alumnus Darcy Tucker. 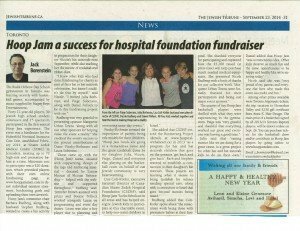 The money they raised will help support the new Neonatal Intensive Care Unit (NICU) at the Shaare Zedek Medical Centre in Jerusalem. This was the second annual Hockey Night in Toronto hosted by the Canadian Shaare Zedek Hospital Foundation. Tucker was joined on the ice by 17 top fundraisers for a one-hour game followed by a private cocktail reception for donors, which included a silent auction. “Having the once-in-a-lifetime chance to play hockey with former Maple Leafs Darcy Tucker was a very challenging but exhilarating experience,” said Lawrence Mandel, event co-chair. It was the first of two events in the foundation’s Slice the ICE for Neonatal Care fundraising series, which aims to raise $145,000 for the Israeli hospital. 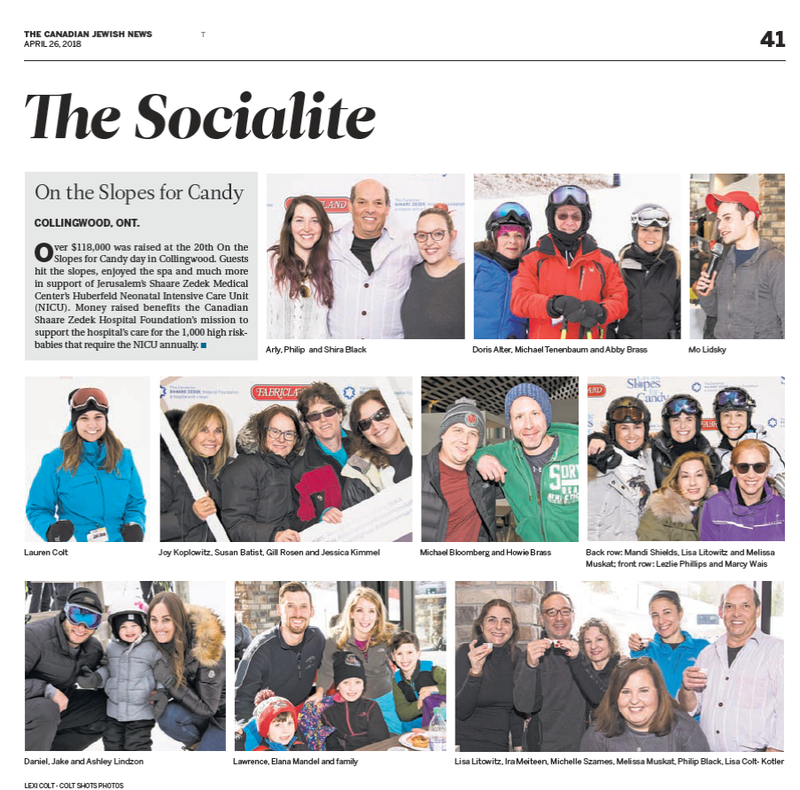 The second event, On the Slopes for Candy, will take place on Wed., Feb. 26 at the Alpine Ski Club in Collingwood. The day of skiing and snowboarding fun will include luxury coach service to Collingwood, free lessons, races and a kosher buffet breakfast and lunch. On the Slopes, which has raised about $750,000 during the past 16 years, was renamed in honour of the late Candy Schaffel Black who died of cancer in 2011. Schaffel Black and her husband Philip Black were devoted supporters of the NICU at Shaare Zedek Medical Centre. The hospital’s Next Generation Building, dedicated to women’s health and pediatric care, is scheduled to open soon as part of a $60 million expansion. The building’s top two floors will house the Huberfeld Family Birthing Centre, additional maternity departments and the largest and most advanced NICU in Israel. For more information or to purchase tickets for On the Slopes with Candy, visit www.slicetheice.ca. On television, they provide escape for prime-time audiences, but Israel’s former prisoners of war can never flee their reality. 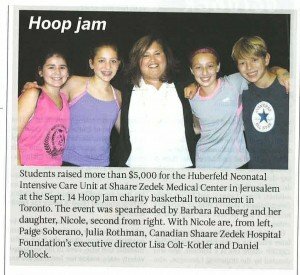 Raff’s remarks came at the recent From the Heart gala, the annual fundraiser of the Canadian Shaare Tzedek Hospital Foundation. This year, Toronto’s Beth Tzedec Congregation co-sponsored and hosted the festivities, which drew about 300 guests. Beth Tzedec will direct proceeds to synagogue renovations, while the hospital’s funds will support its Israel Defence Forces clinic, which treats more than 12,000 soldiers annually in peacetime. 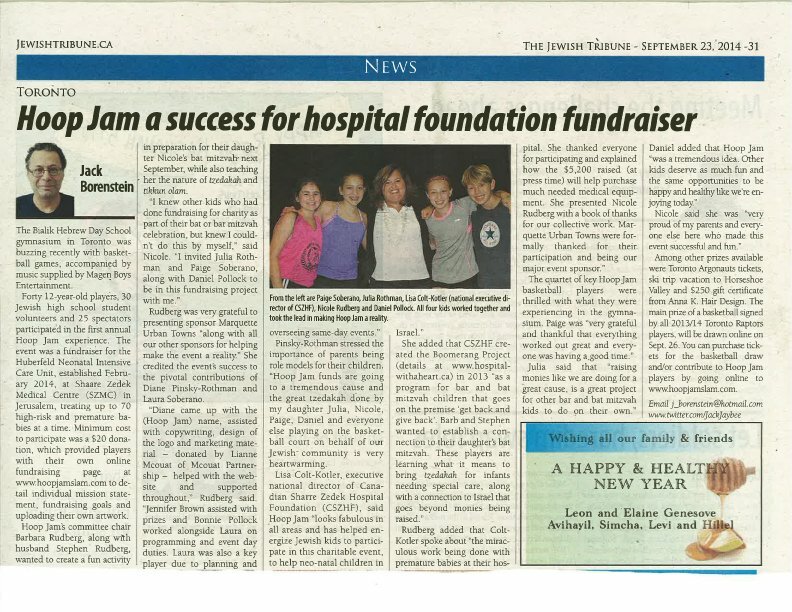 Shaare Tzedek made news recently with its humanitarian response in the typhoon-torn Philippines. MP Irwin Cotler was also awarded the inaugural Kurt and Edith Rothschild Humanitarian Award. Long before Raff put pen to paper, he was interested in POWs. About 1,500 former POWs live in Israel, mostly from the Yom Kippur War, and their unique form of post-traumatic stress disorder is difficult to cure. As a group, POWs around the world struggle to sustain their marriages and to hold down jobs. They even have a higher percentage of a certain type of bone cancer. And the trauma is hardly confined to the returning POW. Homeland, part of the recent torrent of Israeli shows to storm Hollywood, focuses on Nicholas Brody, an American Marine POW who has returned to the US but might have switched allegiances to Al Qaeda. The show hews to the Israeli original’s core story. Still, a few key elements changed somewhere between Tel Aviv and Los Angeles. For example, the American thriller has largely gripped viewers without inciting controversy. But the Israeli version touched on a taboo subject and unleashed uncomfortable emotions. The Israeli show also paid more attention to the emotional turmoil of the former captives. After the show went to air, Israelis couldn’t get enough of the compelling web of characters. Actors portraying POWs were hugged on the street by solace-providing viewers; one man even pestered a cast member to show him the torture scars he had sustained. At times during filming, actual and fake POWs converged. Shalit, who was released on the last day of shooting the second season of Hatufim, visited the Homeland set in Israel. “His life unfortunately is not a TV show,” said Raff. TORONTO — Liberal member of Parliament and former justice minister Irwin Cotler was the recipient of the Kurt and Edith Rothschild Humanitarian Award at the recent annual Canadian Shaare Zedek Hospital Foundation’s From the Heart gala. 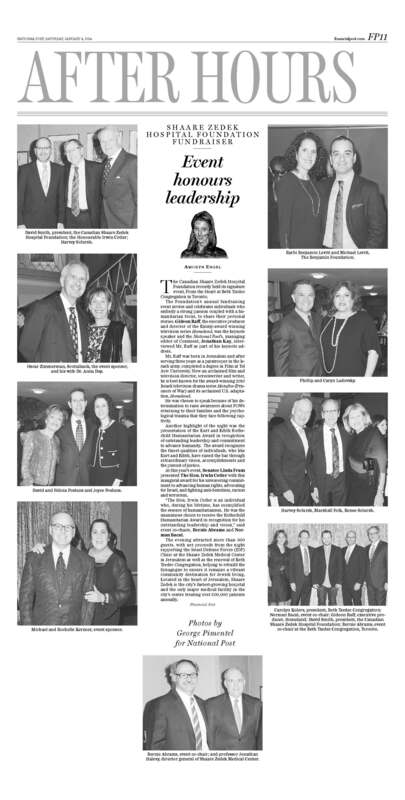 “Irwin was the unanimous choice, in recognition of his outstanding leadership and vision,” said Bernie Abrams, who, with Norman Bacal co-chaired the event, this year co-sponsored by Beth Tzedec Congregation of Toronto. In in addition to teaching law at McGill University and his parliamentary work, Cotler has been a leader in pursuit of justice for such causes as Soviet Jewry, Nelson Mandela, the late Argentine journalist Jacobo Timerman and victims of the brutal uprisings in Darfur and Rwanda. “Kurt Rothschild [a founder of the Canadian Shaare Zedek Hospital Foundation] embodies humanitarianism and is a unifier because of his sheer moral integrity,” Cotler said. Cotler’s wife, Ariela, is a former director of the Canadian Shaare Zedek Hospital Foundation office in Montreal, and his mother-in-law, a Jerusalem resident, has been a volunteer at the hospital. Proceeds from the gala will support the hospital’s Israel Defence Forces clinic and the renewal of the synagogue. The presentation to Cotler was made by Senator Linda Frum before an audience of several hundred supporters. Gideon Raff, executive producer and director of the TV series Homeland was interviewed on stage by a National Post editor Jonathan Kay to conclude the evening. Born in Jerusalem, Raff is a former paratrooper with the Israel Air Force. He was the originator of the Israeli hit TV series Prisoners of War, on which Homeland is based. The first season of the Israeli series was written from the perspective of the returning prisoners, and the second was more about those who are still imprisoned and gave insight to the captors, Raff said. “It makes people cry… Homeland is more of a thriller. Since Typhoon Haiyan hit the Philippines on Nov. 8, the Jewish community has stepped up to help out the devastated country. UJA Federation of Greater Toronto reports that as of Nov. 15, it has raised more than $85,000 since establishing the UJA Philippines Typhoon Relief Fund, with 100 per cent of the money going to support the efforts of IsraAID, the Israel Forum for International Humanitarian Aid, UJA’s partner agency. Steven Shulman, UJA Federation’s campaign director, said that in the past, federation has qualified for a program whereby the government matches funds raised for emergency aid, and he expects it will qualify again. On Nov. 11, a seven-person IsraAID team of Israeli professionals including medical, trauma and relief specialists landed in the Philippines and travelled to Tacloban, a coastal city of 220,000 that was almost destroyed by the typhoon. Shulman said a second IsraAID team, comprising 15 to 20 medical and trauma personnel, was set to join their colleagues and travel north where a hospital is set up. “We’re looking to send a third team. IsraAID works with local government officials and the United Nations to provide emergency services to those affected. [Our] community has a great reason to be proud. It tells you something about Jewish values,” he said. Robin Segall, director of programs and marketing for Ve’ahavta – The Canadian Jewish Humanitarian and Relief Committee, said the agency has raised about $15,000 for its Philippines fund. “Ve’ahavta will be directing funds raised through the Jewish Coalition for Disaster Relief [JCDR], and its response will focus on immediate as well as mid-term needs of the local population. “As an executive member of the JCDR, Ve’ahavta is able to leverage the funds we raise by pooling our resources with those raised by up to 44 other coalition members across the United States and United Kingdom for maximum collective impact. Jewish organizations work in unison to allocate desperately needed financial resources to trusted, reputable partners engaging in immediate first response on the ground,” she said. Terri Boldman, director of marketing and communications for Jewish Federations of Canada-UIA (JFC-UIA), said that the organization is accepting donations on behalf of the federations in London and Windsor and individual donations from non-federated regional communities. She said that as of Nov. 15 Montreal, has raised $38,000, and Edmonton, Vancouver, Hamilton and JFC-UIA have raised about $60,500. Jerusalem’s Shaare Zedek Medical Centre said that it’s been called on to send a team of medical personnel to join IDF medical and rescue response team that was dispatched to the Philippines. The selected members all have extensive training in rescue-and-recovery missions within the IDF Medical Corp and were extensively briefed prior to departure for what they can expect upon arrival in the disaster zone. David Smith, president of Canadian Shaare Zedek Hospital Foundation, said in the release that the money it raises in Canada is being sent to support Shaare Zedek’s IDF clinic and to help train and prepare the medical personnel. In a more local response, at a Toronto bagel restaurant, Bagel World on Wilson Avenue, a group of employees, many of whom are Filipinos, have decided to donate all their tips to the relief fund. Bagel World’s owners were touched by the gesture and agreed to match all the proceeds. Shaare Zedek Medical Centre Video Goes Viral! Toronto, Ontario – Dr. Ofer Merin, is one of many Israeli physicians who have been secretly providing humanitarian medical support to the Syrian refugees. The Deputy Director General of Shaare Zedek Medical Center in Jerusalem, Lieutenant Colonel in the Israeli Defence Forces and Commander of the IDF Field Hospital, Dr. Merin has been involved in recent months in treating hundreds of Syrian refugees injured in the civil war at a fully equipped field hospital located on the Israeli-Syrian border. Until recently, this humanitarian medical effort remained a top-secret military operation. For more than 110 years, Shaare Zedek Medical Center has responded to the needs of the people of Jerusalem by providing world class health care for more than 500,000 patients annually. Once a 20-bed hospital on Jaffa Road back in 1902, Shaare Zedek has since transformed into a 1000 bed facility with Centers of Excellence that treat patients of every race, religion and nationality. Known as a Hospital with a Heart, Shaare Zedek Medical Center relies on donors around the world as it does not receive government support for education, equipment or research. Toronto, Ontario–The Canadian Shaare Zedek Hospital Foundation is proud to announce a new event called Slice the ICE for a cause which combines two great Canadian winter traditions hockey and ski, for one important cause. Last year, On the Slopes was renamed in memory of Candy Schaffel Black, who passed away after a long battle with cancer. On the Slopes for Candy has raised over $500,000 since its inception and in 2012, raised over $75,000 with proceeds benefitting the purchase of an incubator and cardiac monitor to support approximately 700 high-risk infants in the Neonatal Intensive Care Unit (NICU) at Shaare Zedek Medical Center. Slice the ICE for a cause will combine On the Slopes for Candy with a new event called Hockey Night in Toronto. Hockey Night in Toronto will take place on Sunday, January 27th, 2013 featuring NHL Alumnus Darryl Sittler. In honour of the inaugural year of Slice the ICE, Darryl will play in a special daytime exhibition hockey game for the top 20 online fundraisers and then party with guests at the Hockey Hall of Fame on the evening of Sunday, January 27th. 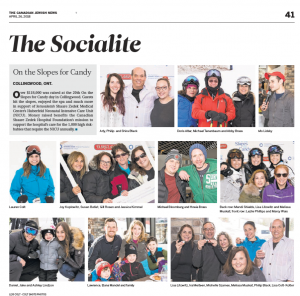 On the Slopes for Candy will take place on Thursday, January 31st at the Alpine Ski Club in Collingwood and includes a fun-filled day of skiing, snowboarding, snowshoeing and more. Proceeds from Slice the ICE for a cause will purchase critically-needed medical equipment for the NICU at the Shaare Zedek Medical Center in Jerusalem. For more than 110 years, Shaare Zedek Medical Center has responded to the needs of the people of Jerusalem by providing world class health care for 500,000 patients annually. Once a 20-bed hospital on Jaffa Road back in 1902, Shaare Zedek has since transformed into a 700 bed facility with Centers of Excellence that treat patients of every race, religion and nationality. Known as the Hospital with a Heart, Shaare Zedek Medical Center relies on donors around the world as it does not receive government support for education, equipment or research. 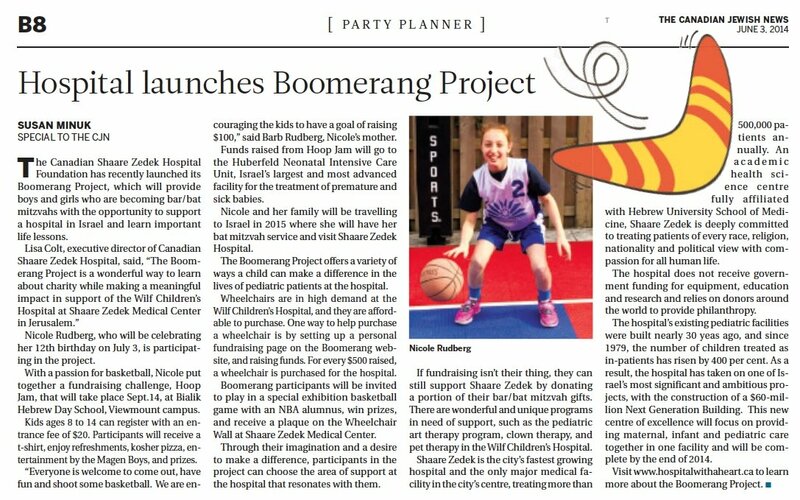 A partnership between the Canadian Shaare Zedek Hospital Foundation and the North York General Hospital Foundation will help to transform pediatric facilities in Toronto and Jerusalem. The Bridging Children’s Health campaign was created to unite the two hospitals in a shared commitment to improving health care for children, teens and their families, they said in a statement. The campaign culminated in an event presented by First Capital Realty that featured keynote speaker Rudy Giuliani, former mayor of New York City. 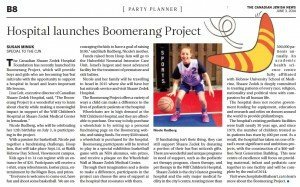 The campaign raised $1.1 million toward the redevelopment of North York General Hospital’s child and teen program facility and the construction of the New Generation Building, which houses the Wilf Children’s Hospital at the Shaare Zedek Medical Center in Jerusalem. The Shaare Zedek Medical is in the final stage of its $60-million campaign to complete the construction of the New Generation Building housing the Wilf Children’s Hospital, the most active maternity hospital in the western hemisphere with approximately 15,000 births each year. The existing pediatric facilities were built nearly 30 years ago and, since 1979, the number of children treated as in-patients has risen by 400 per cent. The New Generation Building is one of the most significant and ambitious projects in Israeli medicine, with its focus on providing maternal, infant and pediatric care together in one facility, she said. Colt-Cotler said that the $150-million campaign for North York General is the largest comprehensive campaign ever undertaken by a Canadian community hospital and will provide it with the resources to remain a centre for exceptional care and teaching in a diverse community of more than 400,000 people. The campaign hopes to raise $5 million to redevelop the hospital’s child and teen program facility, which will include a greater number of private in-patient rooms, and will provide greater comfort and convenience for children, teens and their families. The Bridging Children’s Health campaign honoured two doctors who have provided extensive contributions to heath care. Dr. Ofer Merin is a cardiothoracic surgeon, lieutenant colonel in the Israel Defence Forces and deputy director general at Shaare Zedek. He has close ties to Toronto and North York General, having completed his fellowship in Toronto and having led grand rounds at North York General on a recent visit. He was given responsibility for emergency readiness at Shaare Zedek in 2007, and was subsequently appointed as director of the hospital’s trauma unit. As commander of the IDF field hospital over the last 10 years, he has also served as the director of surgical operations in the field hospital that has performed emergency relief in Haiti and Japan following natural disasters. The second honoree, Dr. Noah Forman, began his career in emergency medicine at North York General Hospital and also serves as medical director for the Toronto Maple Leafs and Toronto Fire Services. Toronto, ON-On November 9, 2012, Yarden Frankl, will attempt a 260 kilometer non-stop bike ride from the Hermon Mountain in the Golan Heights past the Dead Sea and then to his home in Neve Daniel. The ride will go from Israel’s highest elevation to its lowest and then up to the country’s second highest spot. Yarden is embarking on this journey to raise funds for the Oncology Department of Jerusalem’s Shaare Zedek Medical Center in support of his wife Stella. Last June, Stella visited the Shaare Zedek emergency room with stomach pains. Unfortunately, those stomach pains turned out to be late stage stomach cancer. Despite initially receiving a poor prognosis, Stella, with the support of Yarden and their four children, is still fighting today. The Canadian Shaare Zedek Hospital Foundation has taken on the challenge of matching Yarden’s goal of raising $25,000 in the $25 for $25K Charity Challenge for a Cure Campaign in support of Yarden’s Journey. The Canadian Foundation is reaching out to all Canadian donors to support Yarden in his wife’s journey to fight cancer with a $25 donation. Darren Calabrese / National Post Former New York City mayor Rudy Giuliani poses in Toronto on, September 10, 2012. TORONTO — On the eve of the eleventh anniversary of Sept. 11, former New York mayor Rudy Giuliani warned “it isn’t over” for enemies preying on America and said Republican Mitt Romney is the better choice to lead the country through precarious times. Mr. Giuliani was in Toronto to headline a fundraising event for children’s health-care facilities in Toronto and Jerusalem, and sat down with the Post to discuss the dark legacy of the Sept. 11 attacks, the U.S. presidential race, the killing of Osama bin Laden, and his own ambitions. The typically outspoken lawyer and businessman was more reserved than usual — he does his best not to speak ill of President Barack Obama outside the United States, he said, out of patriotism. “Both men [Mr. Romney and Mr. Obama], although they take different approaches, are equally dedicated to making sure [an attack] doesn’t happen again,” Mr. Giuliani said from the home of retired Canadian senator Jerry Grafstein, who hosted the outdoor soiree put on by the North York General Hospital Foundation and the Canadian Shaare Zedek Hospital Foundation. Mr. Giuliani said he respected Mr. Obama for going after bin Laden; when asked whether he agreed with Republican critics who accuse Democrats of politicizing the death, he offered an explanation rather than the condemnation he has unleashed south of the border. “Sometimes in politics we take too much credit for our successes because we get so much blame for our failures,” he said. He said he did not watch Sunday night’s 60 Minutes interview in which U.S. Navy Seal Matt Bissonnette recounted the May 2011 bin Laden raid, although he said he recently picked up Mr. Bissonnette’s controversial book No Easy Day. The 68-year-old has his own storied relationship with politics. In 1981, Ronald Reagan appointed him U.S. Associate Attorney General; just over a decade later, he was elected the first Republican mayor of New York City since the 1960s, and in 2008, he ran and then withdrew from the Republican nomination race. He was touted widely as a presidential hopeful last year, but in October he shot down rumours of a 2012 run. Still, he has remained in the headlines and at the forefront of American politics, for example offering biting remarks at this summer’s Republican convention in Florida. Indeed, at a time when Washington is divided and loathed like never before, and when politicians are accused of skirting the truth with partisan rhetoric, Mr. Giuliani is conspicuous for his blunt assessments across party lines. Once a Democrat himself, Mr. Giuliani is a pro-choice, pro-gay marriage Republican who for nearly a decade presided as mayor of a liberal city in a solidly Democrat state. Derided by some as over-the-top, Mr. Giuliani’s name has nonetheless been floated for a future Romney cabinet and, perhaps, a 2016 presidential bid.